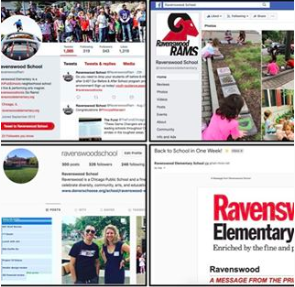 FORS strives to make an impact in three areas: community, communications, and fundraising for Ravenswood School. Establishing an Instagram account to share visual updates and engage in a new way. The account now has 350+ followers. Sending home 555 printed calendars every month, in English and Spanish, to ensure students and families were always aware of the latest news and activities. Establishing Moms’ Nights Out and Dads’ Nights Out, so that parents could meet and mingle. Supporting, though volunteer hours, funds, and communications, school information events including School Tours, the Back to School BBQ, and the First Day of School Coffee, so that current & prospective families remained aware of school events and activities. Assisting our teachers in many different ways, including providing countless hours as Room Parents, sharing updates with Donors Choose and Teacher Wish lists, and showing our constant appreciation through Teacher Appreciation Week and the Back to School Breakfast. Reaching out to our community to connect, share, and celebrate together, through the Costumes & Clothing Swap, the Halloween Parade, Holiday Carolling, the International Club Potluck, the Family Day of Service & Chili Cook Off, Open Mic Night, the Spring Forward, Street Festival support, and Summer Play Dates. Supporting salaries for our essentials teachers. CPS provides funding on a per-student basis, and requires a number of student hours in essential subjects beyond the classroom - but the funding isn’t alway sufficient to support those hours. FORS funds filled in the gap. Supporting the 8th grade class trip. For many of our 8th graders, the annual class trip to Washington, DC is the first time they’ve ever left Chicago. 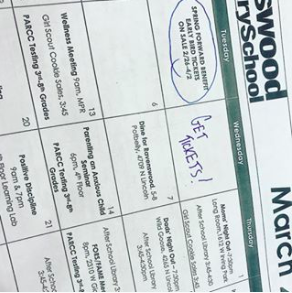 FORS supplemented fundraising done by the 8th graders, to ensure that transportation, room & board, and all event & museum tickets were fully funded for each attending student. Improving our cafeteria / gym / auditorium. Our giant multi-purpose room received funds from FORS, and through the Auction for Education held during the Spring Forward benefit, for many improvements. These included giant fans to provide a more comfortable learning and lunchroom environment; sound improvements to support our auditorium and physical education classes; structural supports; baffling along the walls and under the stage to ensure student safety; and basketball hoops and backguards to provide a fun, physically active environment. Funds from the previous year went towards a climbing wall along one side of the gym. The climbing wall helps students build confidence and athletic ability. Campus & community improvements. These include benches around the trees on Paulina St, so that caretakers can relax before drop-off and pick-up; mosaic materials, to complete our beautiful, community facing mosaic at Montrose & Paulina; and a variety of paint & cleanup supplies for school beautification & landscaping. Performing arts support. This included a new dance room floor, performance stairs for our drama room, musical sets & scripts, costumes for our school musical & showcases, and instructional materials for our dance & drama classes. We also supported Old Town School of Folk Music instruction and arts education for our students.